Boog, a painter and illustrator, was born in Lucerne, Switzerland and came as a child to America. He studied at the Art Students’ League in New York, and later in Paris at the École de des Beaux Arts with Louis Bonnat. He exhibited at the Paris Salon of 1904. 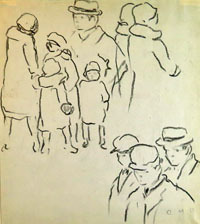 Boog, who lived most of his life on Parkville Avenue in Brooklyn, was a member of the Salmagundi Club and exhibited at the National Academy Design, Pennsylvania Academy of the Fine Arts, Corcoran Gallery of Art, Rochester Memorial Art Gallery, American Watercolor Society, Allied American Artists, and the Brooklyn Museum. His work is found in the permanent collections of the Museum of the City of New York, the Museum of the University of Nebraska, and the Historical Museum of Bennington, Vermont. Boog illustrated a number of books, including an edition of James Fenimoore Cooper’s Leather Stocking Tales and How It Came About Stories by Frank B. Linderman.
. Bénézit, Dictionnaire Critique et Documentaire des Peintres, Sculpteurs, Dessinateurs et Graveurs, Gründ, Paris, 1999. Peter Hastings Falk, Who Was Who in American Art, Sound View Press, Madison, CT, 1999.